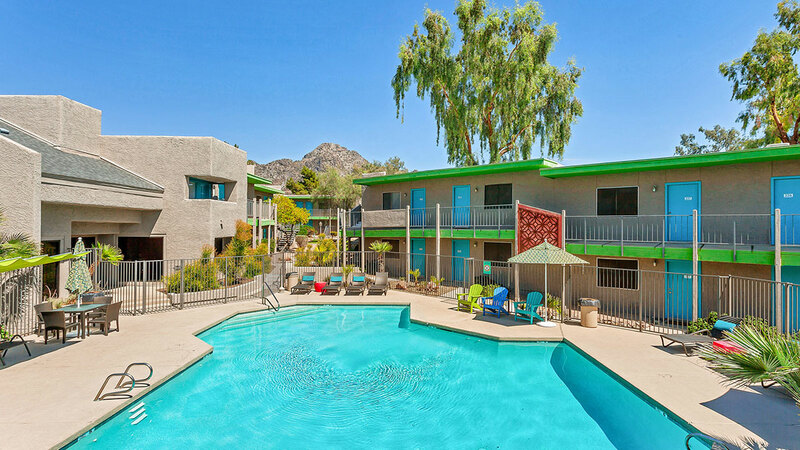 Phoenix, Ariz. – March 22, 2019: ABI Multifamily — the Western US’ leading multifamily brokerage and advisory services firm — has announced the $22,200,000 / $123,333 Per Unit / $194.81 Per SF sale of Cabana at the Pointe Apartments in Phoenix, Ariz.
Cabana at the Pointe is a 180-unit garden-style apartment community located off SR 51 near the Pointe Hilton Resort. The highly desirable North Central Phoenix neighborhood is surrounded by a luxury resort and highly established residential community near the Dreamy Draw Recreation area, and is just minutes from 7th Street’s Restaurant Row and the Central Phoenix employment corridor. Completed in 1980 and renovated in 2013, Cabana at the Pointe features wood-style flooring; newer, granite-looking countertops; wood cabinetry and a colorful, tasteful exterior and common area amenities package. The Buyer is a Colorado-based private investor. The Seller is an investment partnership based in Arizona. The Seller was represented by the multifamily brokerage team of Alon Shnitzer, John Kobierowski, Rue Bax, Eddie Chang and Doug Lazovick.